This being the first year for Toronto - Brampton it was GREAT!!! 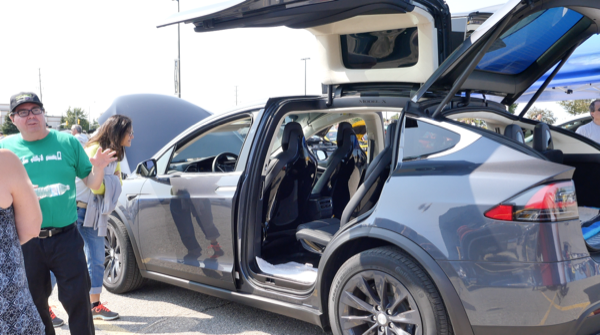 We were part of a ICE Classic Car Show in it's 11th year a fundraiser for Prostrate Cancer and had 600+ ICE cars and owners with a lot of questions - The 2 Tesla X gave us the draw to talk to people about all EVs and when the Tesla's did "Easter Egg" with flapping doors the crowd was over the top. Looking forward to 2018 more EVs and more interest. National Drive Electric Week comes to Toronto - Brampton! The future of transportation is electric - the luxury of charging at home, skipping gas stations, and driving on clean energy are just some of the many reasons to switch to electric vehicles (EVs). With current all-electric models like the Nissan LEAF, Chevrolet Bolt, and Tesla's Model S, X, and upcoming Model 3, affordable and practical EVs are sweeping the nation. Join our event for a look at some of the newest EVs available, experience the joys of electric driving, and learn from local owners (10 - 15 with their cars) the benefits of choosing an EV for your next car. Register above and be entered to win a $250(*US) gift card. A $10.00 donation per vehicle to Prostate Cancer - All in attendance can get a FREE Prostate Cancer test. Food Trucks and a lot more - Join US !!!!! Registered attendees report 251,792 electric miles driven.